History: (Iron Man I#309) - The Avatars stood around in the shadows as the Mandarin crafted his plans. 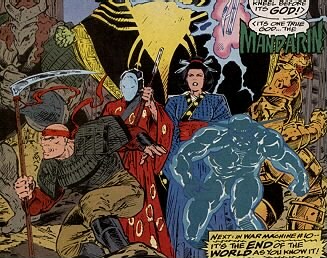 (War Machine#8) - Still in shadow and unnamed, the Avatars and the Mandarin watched the Iron Man/War Machine battle. 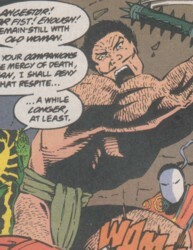 QWake expressed disbelief at the Mandarins defeats at the hands of Iron Man in the past. (Iron Man I#310) - The Mandarin sent the (still in shadow and unnamed Avatars) to attack Hong Kong. (Force Works#6, Marvel Comics Presents#169/2, #170/2,#171/2) - Lich, Butterfly, Deluge, Foundry and QWake attacked Hong Kong, and were defeated by Force Works, and retreated. Warfist, Ancestor and Old Woman watched while the Mandarin tortured Iron Man and War Machine, and failed to stop Centurys attack, forcing the Mandarin to intervene, seemingly killing War Machine and Century. (War Machine#9) - Warfist and Ancestor thrashed the helpless Iron Man until the Mandarin called them off. Force Works interrogated their captive, Lich. BTS- Lich rejoined the other Avatars with the Mandarin. 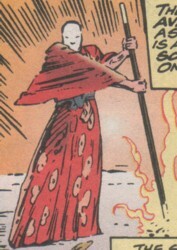 (Iron Man I#311) - The Avatars watched as the Mandarin continued to torture Iron Man, and created an enchanted mask to transform a peasant into the newest Avatar, Turmoil. The Mandarin then sent them away, to unmask Iron Man alone. (Marvel Comics Presents#172/2) - Ancestor, Warfist and Old Woman were standing behind the Mandarin as the Scarlet Witch attacked. Stark is mistakenly depicted in full Iron Man armor and War Machine is shown there as well. (Force Works#7) - US Agent and Spider-Woman battled the Mandarins armies, defeating Old Woman, Sickle, Warfist and Ancestor, who Agent slammed through a wall, apparently killing him. Scarlet Witch caused the Mandarins rings to all misfire at once, with the blast killing Warfist. The Mandarin led the Avatars in his attack on Hong Kong. (War Machine#10) - The Avatars were sent out to find the survivors of the Mandarins attack, and prepare them for his coming. And to break stuff. They then stood around in front of the Mandarin as he gave his speech. (Iron Man I#312) - The Mandarin sent the Avatars (including the supposedly-dead Ancestor and Warfist) back to Hong Kong to capture Iron Man, who allowed himself to be taken, and infected the Mandarin with a techno-organic virus that rapidly aged him, and turned Deluge to dust with a touch, leaving only his mask. As the Mandarin reached out to the Heart of Darkness, it flew away, and the Mandarin and his Avatars disappeared. (Iron Man III#10 (fb)) - In an erroneous re-telling of the end of Iron Man I#312, a man claiming to be the Mandarin (but possibly Warlord Chu Lo Yan?) claimed that the Heart of Darkness and the Avatars were destroyed. (Civil War: Battle Damage Report#1) - The Avatars secretly served Mandarin ntil his apparent demise in the explosion of the "Dragon of Heaven". Afterwards they fell into service of Temujin, Mandarin's son. (Heroes for Hire II#1) - The Avatars returned to fight in the name of the new Mandarin (Temujin) and attacked New York City. They were too much for the police too handle and the Heroes for Hire were called in to deal with. Colleen took out Lich and Sickle. Humbug defeated Ancestor. Shang-Chi knocked out Warfist. Tarantula ferociously attacked the giant Q'Wake and he went down quickly. Foundry underestimated Misty and was knocked out after she blinded him. Heroes for Hire 1! Mandarin's Avatars 0! (Dark Reign Files) - Quasimodo researched the Avatars for Norman Osborn. Comments: Created by Dan Abnett, Andy Lanning, and Dave Taylor. 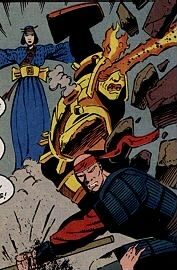 Speculation on the return of Ancestor and Warfist: Given that the Avatars were empowered by enchanted masks, it may be new incarnations of Warfist and Ancestor appearing in Iron Man I#312. That or they werent really dead. The same could be the reason behind their recent return in Heroes for Hire II#1. 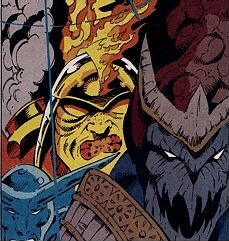 Warfist's name was originally reported as "Warcry" in the Iron Man/Force Works Collector's Preview. 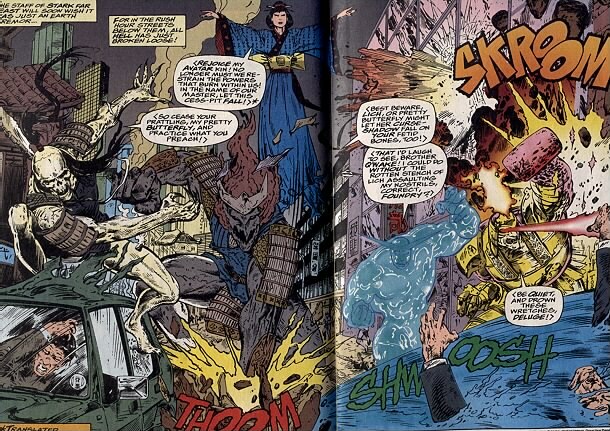 The Marvel Comics Presents issues re-told the same events from the point of view of certain characters. The Avatars retreat was shown only in MCP#170. Sure, the Avatars didnt do much beyond serve as henchmen for the good guys to beat on, but the Mandarin deserves his own team of henchmen, and they deserved better than an off-panel death. They received an entry in the Civil War: Battle Damage Report#1. Ancestor: Able to draw on the strength of his ancestors to increase his own size and strength to superhuman levels. He was seemingly killed by US Agent, yet returned again for the finale. 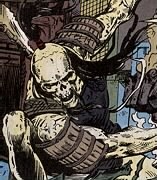 He returned yet again in Heroes for Hire and was defeated by Humbug. Butterfly: Seemingly the leader of the group, Butterfly could fly, and project a curse shadow, causing extreme and violent bad luck to befall any caught under it, such as making guns explode or US Agents photon-shield misfire. Deluge: Possessed a liquid-body and control over water, and possibly other liquids. Sort of a bargain-basement Chinese Hydro-Man, and the groups other arrogant blowhard. Accidentally killed by the Mandarin. Foundry: Able to fire a flame-blast from his eyes, and to morph his hands into weapons such as hammers. Foundrys size would suggest a possible enhanced strength-level. He returned in Heroes for Hire and was defeated by Misty Knight. 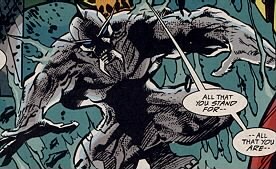 Lich: A former diplomatic assistant (and thus one of the only Avatars to speak English), transformed into a skeletal monster, who used his claws, and strength on a level to snap Spider-Womans webs and grapple with her. Lich enjoyed his work, taking pleasure in the killing of innocents. Force Works captured him, briefly, but he joined the Avatars behind-the-scenes. He returned in Heroes for Hire and lost together with Sickle against Colleen Wing. Old Woman: An elemental sculptress, channelling her power through her staff, could re-shape the ground (and presumably anything else) into other forms as she desired. QWake: Huge monstrous Avatar, with apparent superhuman strength, and a seismic shock power. QWake was an arrogant blowhard compared with the mostly untalkative Avatars. Seemingly grown a few feet he returned in Heroes for hire and was defeated by Tarantula (Maria Vasquez). Sickle Represented field workers of China, and had superhuman strength and a scythe. He returned in Heroes for Hire and lost with Lich against Colleen Wing. Turmoil: A peasant servant of the Mandarin, transformed into the "living incarnation of the storm." Turmoil then disappeared between pages (by the next panel, even), never to be seen again. Warfist: Superhuman strength and martial arts skills. Wielded a spiked club. He was accidentally killed by the Mandarin, only to return again for the finale. He returned in Heroes for hire yet again and was defeated by Shang-Chi.